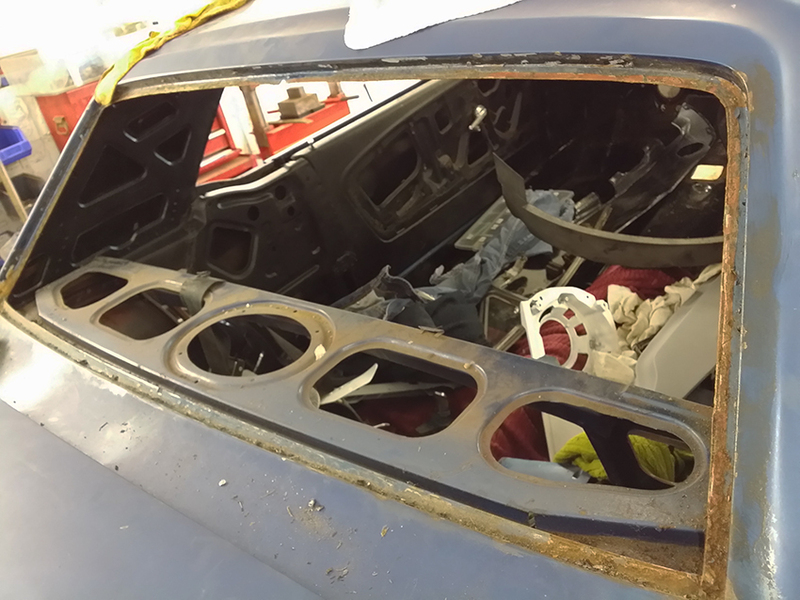 The glass in my car has to be removed in order to fit the roof lining and the spray job needs to be around the windows and treat any signs of rust there. It’s obvious the front has been leaking and the windscreen glass was replaced. The replaced it with a thick wad of mastic but this was not the cause of the leak. The leak has come from the cowling under the glass where the vents are. The water collects in the extreme corners and rots the metal way the rain comes in from the vents and into the car. Not from the glass. Also you need to remember that the head liner is also held in place by the glass rubber seals. There are two ways to remove the glass, try to press the rubber away from the glass and gently edge the glass out. OR, get a sharp knife and cut through the rubber seal and lift the glass out. I went for the later as the glass in the rear looks original and probably brittle. The rubber was showing signs of ageing with splits and a little perishing. Find a place where the rubber will bend away from the glass and stick the knife into the rubber. To make the cut easier I cut a section out in order for me to grab the rubber seal. I found the best way was to lift the rubber seal up and cut at the same time, a technique that took a few goes to perfect but in the end it only took about ten minutes to remove the whole of the top of the Rubber seal. With the top of the rubber removed I went round the inside of the glass and gently tapped with my hand to dislodge the glass a little to break the seal. 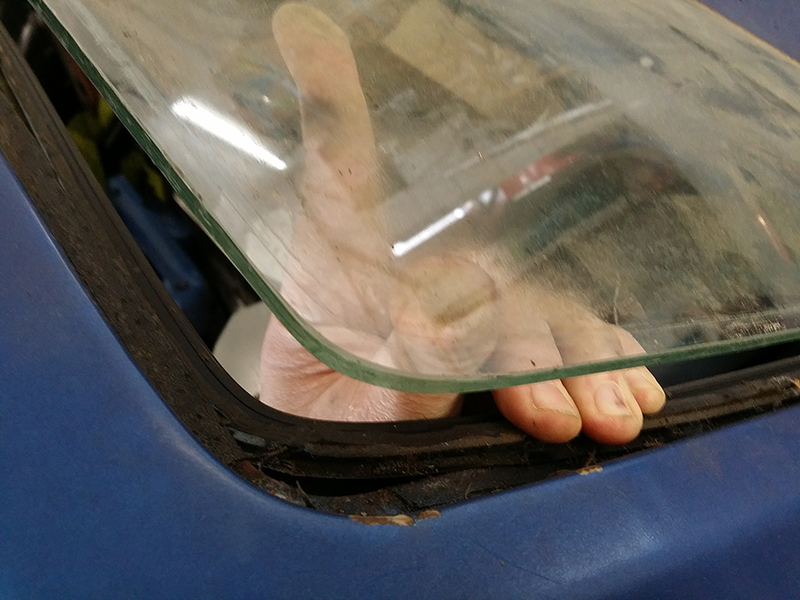 I am lucky enough to have long arms so I could lift the top corner up and grab the glass to remove it. With a helping hand remove the glass and store out-of-the-way. The inner part of the rubber laps over the body work, and you can just see it coming away from the picture above. This is dead easy to remove now and just pulls off. With the rubber out then clean up the metal work. There should be little studs all the way round where the chrome trim fits. If you are unlucky then these sometimes get filed of by people who don’t know what they are doing to fit the glass back. The bodywork around the window looks pretty good and solid showing just a few signs of surface rust. The same principle was used but I was in for a real treat at the front with the extra mastic squirted everywhere. The rubber seal was difficult to lift up at any point to get me going. Eventually I managed to start of and I was taking this in smaller sections as I went along. The rubber was not perished at the front but was stuck to the glass. There was no way I was going to be able to save the rubber and the glass, so the rubber took the hit. The mastic was a real problem and didn’t allow me to get the angle I wanted for the rubber cut, but it was enough. With the outer section of the rubber cut away the glass was stuck to the mastic. Again from inside I gently lifted up the glass over a larger area as I could to not put stress on the glass. The glass popped away and again lifted out-of-the-way. The rubber seal should just pull away but as it was stuck in place I had a delightful job to remove it all so that it could be painted and treated properly. the metal work looked ok except for a little bit at the passenger side bottom. This was not the glass leaking but another issue to be sorted out.